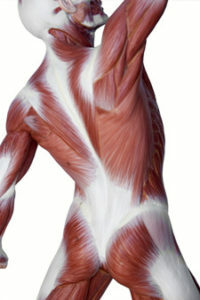 Fascia is head to toe, arm to arm, inside-out connective tissue. It divides our muscles and penetrates them like the internal skin of an orange. It also surrounds virtually every structure of the human body. If we were able to peek inside our bodies and only see the fascia, we would look like a human form of cotton candy with mummy-like bandages running throughout. The entire fascia system is connected in ONE piece like a 3D spider-web. The fascia has a brush point with literally every other system of the body. Fascia is just as significant as every system throughout our body. Having loose, healthy fascia is vital for overall health and well-being. Healthy fascia also makes us look, feel, and function better! HOW ARE FASCIA & CELLULITE RELATED? Experts say that if every part of the body was removed except for the fascia, the body would still retain its shape. Fat (no matter where it is in your body) will take the appearance of fascia, the webbed connective tissue that encases the entire system. When fascia is tight, restricted, or bound, the fat will poke through the fascia irregularly, causing the appearance of bumps, dents, and ripples under the skin. 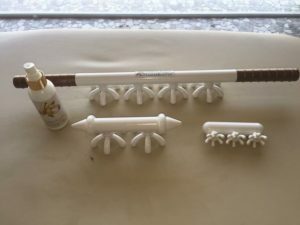 FasciaBlasting is a body therapy method that uses a special tool developed by Ashley Black (called the FasciaBlaster) to release the fascia, ease tension and pain, and improve flexibility, posture, circulation, and the appearance of cellulite. Reduction in pain, changes to physical appearance, and increases in flexibility happen over time, although dramatic changes can occur after just one session. Changes depend on the condition of your fascia and where the fascial adhesions are located. Diet, hydration, physical activity, and other healthy habits also influence the timeline for changes. "In October, Tamara introduced me to the Fascia Blaster. I have Fibromyalgia and at the time had two very painful frozen shoulders and had been using a walker most of the day due to excruciating pain in my hips and legs. Two months later the walker was put away and I have almost full range back in my shoulders. I would recommend trying this to any one suffering from pain. Sue S"
Content copyright 2015, Heavenly Hands of Maricopa. All rights reserved.